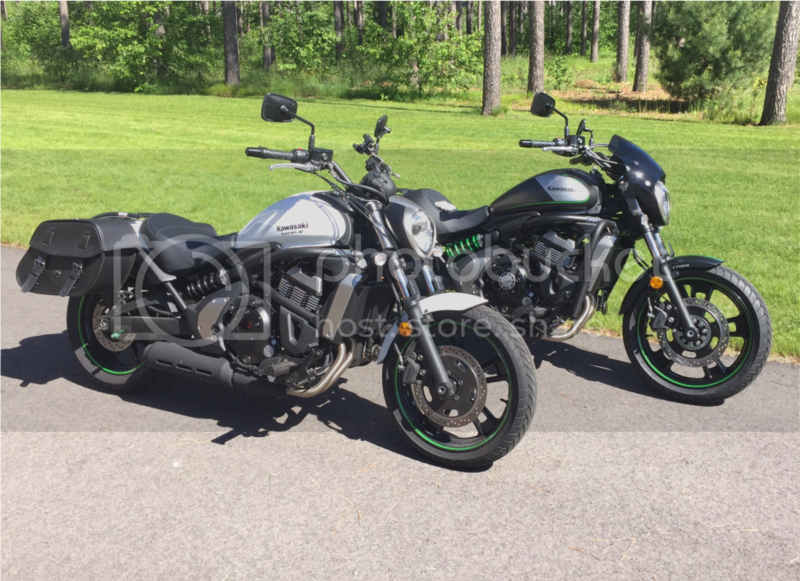 Kawasaki Vulcan Forum : Vulcan Forums > Regional Forums > Central/Midwest > Wisconsin anyone? I am in the Lacrosse area, new old Vulcan owner. this is a GREAT area to ride in always a curvy road. I hope to get my wife on the bike this summer, it would be cool to get a few Vulcans together, not a fan of bar hopping on a bike. From Sauk city WI, lots of good riding around here! Wausau here, Me and the wife both have Vulcan S.
Union Grove, Wisconsin. My Vaquero, and my wife's Honda AERO. Green Bay! My 1st ever cruiser, 2003 VN1600 Classic, which will be a Nomad full dresser by the time I'm done with it. The picture shows my $1200 Classic, and my buddies VN900 with the Pacifico Shadow fairing I installed. I'll be using the same fairing on my Classic. When life throws you a curve, lean into it! Can't wait to fire up the SV once more, and to bring my newest acquisition home from the dealer (2018 Voyager). At least the dealer was cool enough to keep the bike there until the weather clears!